the heat wave is finally here (i think..the weather has been a bit funky here in LA) AND my trip to cabo is coming up in less than a month (yipee)! last time i was in search of swimwear and now...i'm on the search for a beach bag. there were a few i liked and i thought i'd share a the one's i'm considering in case you are looking for one too. i probably only need one...but can't decide. i can see myself with any one of these!!! which one do you like best? maybe you can help me narrow down my choices. do you even think a beach bag is necessary? if you already have one is there one you recommend? I've always liked the simple Vanessa Bruno tote. 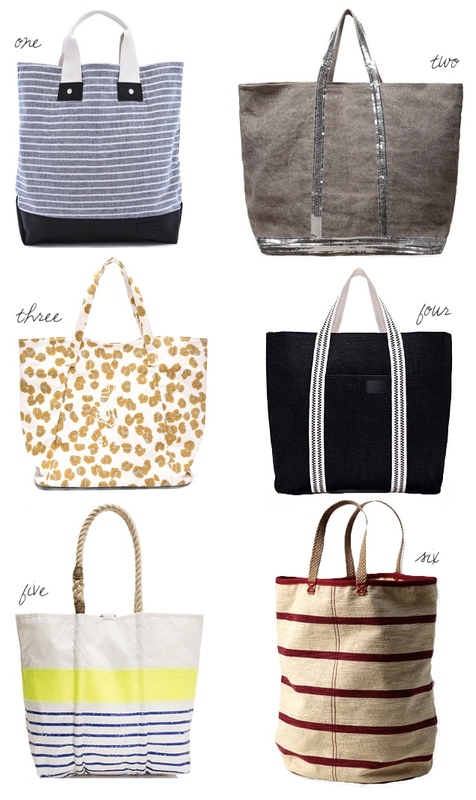 My everyday tote has to be the Longhchamp le Pliages tote. However, it's so tatty that I'm thinking of getting a more durable version - Planetes. oooh love them all!!!! my fave is the 1st one ;) happy friday! I love them all, but my vote goes to #1! (Woot-woot, Jeanne!) I have a Lesportsac that we use for the pool and beach. It's made of nylon so we don't worry about it getting wet and it can take a beating. Cabo sounds so nice right now. Number 1 and 5 are my fave!